Tablet sales were down last year across the board, but there was one bright spot (I mean, besides the success of the Fire tablet). IDC reported that the detachable tablet, or two-in-one tablet, segment boomed last year with the introduction of the iPad Pro. This segment has been around since before Asus introduced the first eeePad Transformer in 2011, but it has always been a footnote in the stats rather than a segment worth reporting. And that changed with the launch of the iPad Pro. iDC reported on Monday that shipments of detachable tablets reached an all-time high of 8.1 million devices sold last year. According to IDC, Apple sold 2 million iPad Pro tablets last year, easily besting the 1.6 million Surface tablets sold by Microsoft. And to put that into perspective, Apple sold around 50 million iPads last year (including the iPad Pro, of course) out of a total market of 206 million tablets sold. Those numbers are still miniscule, but that hasn't stopped IDC from talking them up. "One of the biggest reasons why detachables are growing so fast is because end users are seeing those devices as PC replacements," said Jean Philippe Bouchard, Research Director, Tablets at IDC. "Despite lukewarm reviews, the iPad Pro was the clear winner this season as it was the top selling detachable, surpassing notable entries from Microsoft and other PC vendors." They are right to talk up the iPad Pro; it shipped in November, meaning that Apple shipped more tablets in about a month and a half than Microsoft shipped over the entire year. And they're probably right about how consumers view two-in-one tablets. I can recall in 2011 that I was the only one of the seven eeePad Transformer owners that I knew who had also sprung for the keyboard dock. No one else was buying the KB because they saw the device as a tablet, and not a two-in-one. Similarly, hardly anyone is buying the sub-$100 and sub-$200 two-in one tablets, even though they are decent tablets for the price. The RCA Viking Pro, for example, is a 10" tablet with dock that sells for $80. It is an awesome tablet for the price (although I can also report that the KB dock on my unit is about as useless as the KB cover on the Surface tablet). Similarly, last year E-Fun introduced a couple sub-$200 two-in one tablets which come close to matching the abilities of a $500 detachable from only a couple years before, and yet they're not flying off the shelves. It's almost as if the low-end market is divided between true tablets and Chromebooks, with all the two-in-one buyers going for higher price tiers, wouldn't you say? I’m still a little skeptical about the whole 2-1 aspect. 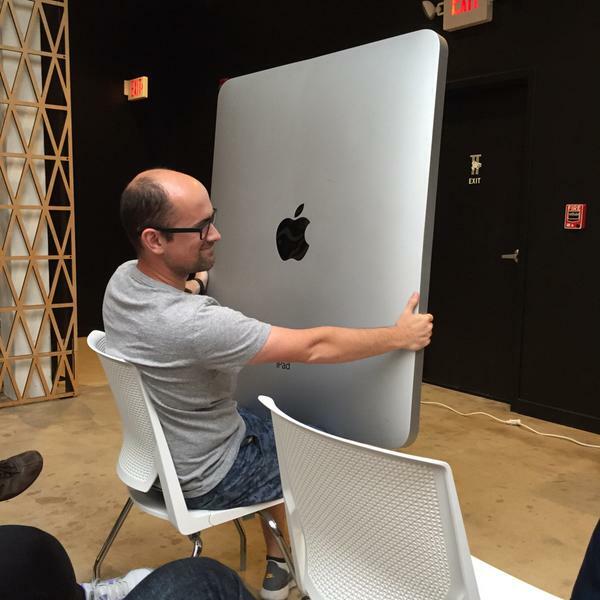 I’m not sure that’s why people are buying the iPad Pro. I think they might just like a really big, very fast iPad. Or many of the sales might be to artists who want to use it with the Pencil. The Surface is a very different animal because it’s promoted as being able to run full desktop apps. The iPad Pro can’t. Don’t forget, the original iPad had an Apple made detachable keyboard option (one I still use and like because of the angle of the keys). Some of this hype about 2-1’s seems to be an effort to promote the Surface by claiming Apple is copying it. They’re very different devices targeted to very different people. I don’t think the Apple fans buying the iPad Pro are looking at it as a laptop replacement. Surface users seem to be. It is kinda hard to regard the iPad Pro as a two-in-one when it doesn’t ship with the keyboard, yes. For all we know people may be shunning the keyboard just as much as they did for the first eeePad Transformer. Edit: The same is true for the Surface for that matter. Are people really using it as a PC replacement? A lot of consultants I work with swear by their Surface Pro’s and they have the keyboard. This statistic could be missing the point entirely. The overall % market drop says much more about who outsold who at the moment, which is often the result of a lingering halo effect that pushes up volume momentarily, but may eventually fade. Note the % market increase is currently for Surface, as it was for PC clones in the mid 80’s. That rise may indicate it is hitting the mark on a new trend, and the iPad no longer is. The fact that iPad Pro was introduced but did little to shore up total sales is telling. It’s funny you should mention PCs; there’s an NYTimes article from 1979-ish which basically says that PCs are over. Imagine on the low end, someone buying an Android tablet wants something more inexpensive than an iPad, and thus doesn’t want to spend much money on accessories. Throw in the lack of updates on many Android tablets, the existence of similarly priced Chromebooks, and (at the very low end) quality issues, and not surprised it’d mainly be plain tablet sales at the low end. I have some friends who are devoted to Windows and swear by the Surface as a laptop replacement. But no real stats to back it up. Tech commentary on the Surface seems to indicate it’s a good laptop alternative. Conversely, most of the commentary on the iPad Pro, even in the rabidly pro-Apple blogshere, says that it’s lacking too many features to be a real laptop replacement. Most advise buying the new super light MacBook. The iPad is an established product line name which has not only name recognition but a base of (slightly) irrational users. The Pro is targeted at a specific group of professional users who had unmet needs in the Apple line and, as a result, they had a much greater uptake initially than other products. The Surface family, OTOH, has very little recognition and loyalty. Its early models were — to put it nicely — crap and the market segment that the Pro targets was NOT (for the most part) buying Surface before this. Add to that MS is not known for their hardware and is no match for the Apple machine and it’s (literally) Apples and Oranges in comparing the two. Give the Surface Pro 5 years and the results will likely be much, much different. A general note on on ipap in Q4, Apple failed to disclose ipad inventory levels in Q4 and they always provide that number. That’s a huge red flag and could mean a big increase in inventory.